i was just reviewing some of my older photos, looking for something i might have been keeping for a later point and forgot about. i think this one qualifies. i posted the front end a couple of years ago, then forgot about it. it happens. i have a lot of pictures, as occasionally someone will comment on whether i have enough yet. well, no. i may be close to filling my hard drive up, but can you really ever have enough? i'm still learning and having fun with your cars and my camera. 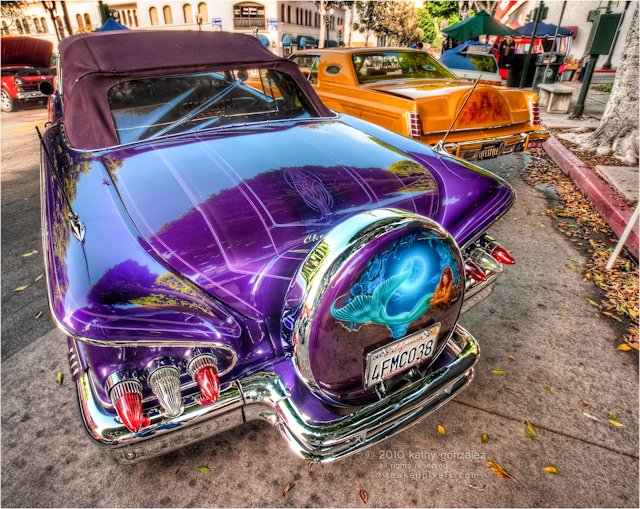 this was from 2010, when the whittier uptown was still a decent show, overflowing in excellence of all types of cars, low riders included. while some of the lifestyles cars showed up this year, this one wasn't one of them. the few that were there had their hoods up, and had a crowd around them each time i walked by. in fact, i only shot one of them, and i'm not all that thrilled with it. this one, i found early in the day, and far enough up the street from the main intersection, that there were few people in the way. though i did go back for more later in the day, and ya, more people. the car is impressive. the paint finish is luminous on these candy cars, almost like you're staring into a pool of water, and you may fall in. interesting airbrushing and pinstriping on many of them, in interesting locations on the cars. liked the mermaid on the back end of this—wonder if its a portrait or just the typical fantasy girl guys wish they had.